You will find Patrol Services of Orlando to be the most professional and to have the highest command presence of any patrol service in your area. We are committed to identifying problems ahead of time while using the latest technology to improve security. Our clients can expect a high-frequency, uniformed armed presence in state-of-the-art marked patrol units. They will be kept informed of the status of their assets through “real time” web-based technology. All Patrol Services of Orlando officers are equipped with satellite tracking systems that allow their whereabouts to be monitored at all times. 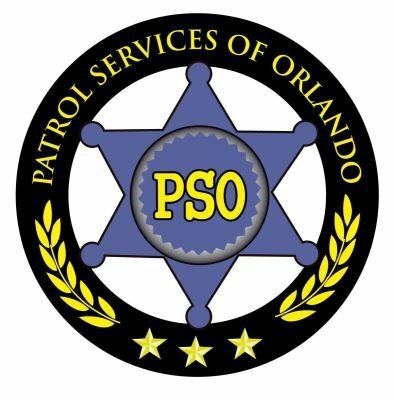 Patrol Services of Orlando is a bonded and licensed security agency proudly serving the State of Florida. We have a multitude of security programs to meet your needs and budget. From Security Guards and cutting edge Patrol Teams to Security Training and Security Cameras, we are your one stop shop. As with all our services, we offer competitive rates and complete customer satisfaction. Our ACTION TEAM serves the community. The Action Team was created as a Company-wide initiative intended to reduce violence, improve safety and enhance the quality of life in Florida's most vulnerable neighborhoods and Industrial areas.. Action is part of the Neighborhood Safety Initiative and its objectives and mandate are in line with our core values. Action is focused on intervention, prevention, enforcement and community mobilization, not punishment. The officers are deployed in single units or teams and are closely monitored by the PSO leadership team. The teams patrol either on foot or bicycle and are easily recognizable by their bright yellow jackets. These five Action Teams are deployed in shifts that provide for a great deal of crossover and information sharing. These shifts also allow the service to field ACTION Teams most days, and every afternoon and evening. This consistent presence allows the officers to have a significant impact in terms of enforcement, security, visibility and crime prevention in challenged neighbourhoods. The Action officers have been deployed and arranged with property management, based on detailed crime analysis which has provided valuable intelligence to the officers. The crime analysis examined crime states that area provided by Police and Sheriff's Departments as well as State and Federal security statistics (including hotspot and cluster analysis). Identifying crime hotspots and analyzing both neighbourhood and crime characteristics within these areas are critical pieces of information for fighting crime. The key to the success of this program is for the Community to take their own ACTION, resolving crime and disorder in the neighbourhood, thus creating a void Patrol Services of Orlando will then work with communities to assist and empower members of our communities to fill that void. Hold or attend a community meeting to discuss how to make your neighborhood and industrial areas safer. Together we can all work towards a safe and secure environment! With a long spanning security career Ron is our President and Chief of Services of Blue Knight Security. With over twenty-five years of executive experience in the security industry, as well as direct hands on leadership. I bring to the table, 25 years of security management and operational experience. I have often said "I could write a book about my experiences" I decided to start this blog to share the things in the industry, that I have seen. I have been working in the security industry for over 25 year. I woke up the other night and I am told that I was speaking in my sleep. I apparently said "I love the security industry 90% of the time and hate it 10%" This is VERY accurate as the companies I have been with, are evolving and fast paced. Having the opportunity to work in Canada, the United stated as well as Central America, I have been able to see several beautiful countries and their security industry. Our growing security and patrol organization is currently accepting applications for the role of Security Officer. The successful candidate will identify and report incidents at assigned client sites, and will be responsible for the security and safety of our clients’ properties. The Security Officer will periodically tour the assigned facility to identify any irregularities, observe protection and fire control equipment, uphold order, and enforce regulations for the facility in regards to the premises, personnel and visitors.